Landon Mayer will join us on Wednesday December 5th at Mudrocks in Louisville, CO to present successful tips for catching quality trout year round. Hi new book, The Hunt for Giant Trout, will be available to view. Michelle Mayer, Dave and Emily Whitlock, Pat Dorsey, Charlie Craven, Ben Furimsky, John Randolph, Steve Henderson, Phil Tereyla, Arlo Townsend, Taylor Edrington, John Miller, Joe Bloomquist, Eric Mondragon, Brian Kraft, Nanci Morris Lyon, Bill Betts, Tommy Lynch, Chad Johnson, Steve Dally, Jason Hamrick, Mark Hamrick, Forrest Smith, Kelly Galloup, Mark Adams, Ross Purnell, John Keefover, Cory Luma, Chuck Gries, Jeff DuClos, Brock Dixon, Josh Greenberg, Ben Bortner, Kelly Neuman, Patrick Fulkrod, Zach Tokach, Doug Ouellette, Blane Chocklett, Chad Johnson, Davy Wotton, John Barr, Greg Flores, Bob Mallard, Scott Graham, Aaron Carithers, Matt McCannel, Jay Nichols, Zack Williams, Ian Harpe, Dr. Mathew Peterson, OD. Landon Mayer’s angling success is fueled by an addiction to pursuing large trout with small flies and lightweight fly-fishing equipment. Mayer enthusiastically teaches and demonstrates his techniques and on-river knowledge to fellow anglers and has developed innovative strategies for sighting, hooking, and landing selective trout. Landon’s passion for fly-fishing has allowed him to make several noteworthy contributions to the sport on and off the water. This has included travels to fly-fishing related organizations of the Mid-Atlantic, West, Pacific Northwest, Southwest, and Southern states, as well as teaching through guided trips, fly-fishing classes, presentations, and demonstrations of his unique techniques. 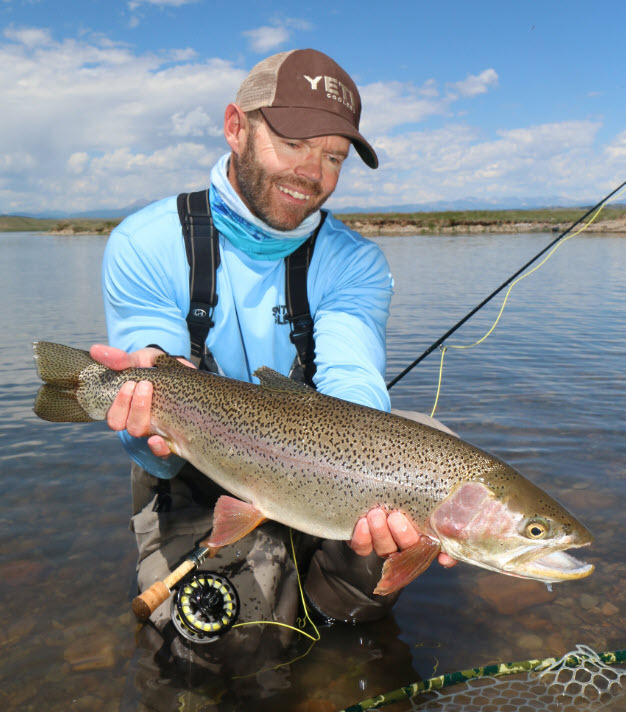 Mayer is a contributing writer for Fly Fisherman and High Country Angler magazines. His contributions also have been featured in publications such as Fly Rod and Reel, American Angler, Southwest Fly Fishing, Field and Stream, and Fish and Fly magazines. Mayer has been guiding in Colorado full time on the South Platte River for the last 22 years, and one full season on the Nak Nek River in AK. He resides with his wife, Michelle, and their four children in Florissant, Colorado.